3" Long, 5/8 oz., Suspending (SDD14), Floating (GDD14). 12-14 ft. Diver. 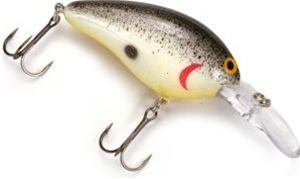 The Norman DD14 is a "Go To" bait for consistent, agressive action whenever fish are sitting deep. On 10-lb. line it runs in the 12-14 ft. range with a medium Heavy action rod.